Any time someone mentions you on Twitter, you will see the person’s full tweet in your Notifications timeline. Twitter includes tools to help filter out the junk from stuff you care about, so if you want to keep yourself from having to look at junk in your Notifications timeline, then you might want to enable Twitter’s quality filtering tools. You can enable the quality filter both from the web and from the mobile app on your iPhone or iPad. We’ll show you both methods, but keep in mind, you won’t need to do both as your settings sync across all of your devices when you enable the quality filter from just one device. To turn on the Twitter quality filter, you will need to adjust your Twitter settings. 2) Click on the blue Settings button at the top right of your Notifications feed. 4) Click on the blue Save Changes button to append your new quality filter settings. Now your quality filter has been enabled and be effective immediately. 1) Launch the Twitter app from your device’s Home screen. 2) Open the Notifications tab and then tap on the Settings cog button at the top left. 3) Toggle on the Quality filter switch. 4) Tap on the blue Done button at the top right of the interface to save your changes. Now the quality filter has been enabled right from your mobile Twitter app. Easy enough, right? 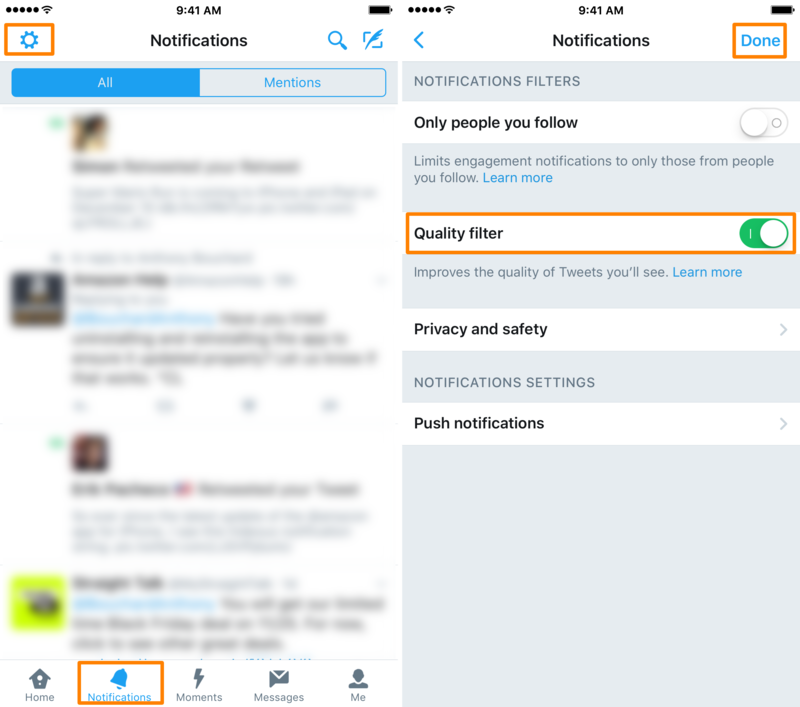 Will you be using the Twitter quality filter on your account, or no? Share in the comments below!